Combining industry-leading performance with a modular, user-configurable platform results in a flexible test instrument that can adapt to changing test requirements. ElectroForce TestBench configurations were designed with component testing in mind, and thanks to their modular approach, a wide array of configurations and performance capabilities are possible. These instruments can be configured with 200N, 400N, or 3kN ElectroForce linear motors mounted on a horizontal baseplate and include multi-channel and multi-axis options. Reaction brackets are pre-designed to allow attachment of components or the test specimen to the mounting baseplate. In addition, a saline bath can be provided as an environmental option. By selecting the proper baseplate and ElectroForce® motor packages, a variety of testing needs can be addressed. ElectroForce linear actuators can be chosen for a 13mm displacement range (200 or 400 N capacity options) or 25mm displacement range (3kN capacity). Additional actuators can be mounted to the base plate and operated independently or simultaneously. The Extended Stroke Actuator significantly extends the range of testing capability, delivering high frequency, dynamic testing with more than 160 mm of displacement for creep/pull-to-failure test protocols in one instrument. The extra displacement is beneficial for biomaterials and tissue testing applications, including tendons, ligaments and skin in which high strain is often expected. In addition, there are many traditional material testing applications involving polymers, elastomers, and thin films for which this long-stroke capability is also required. The ES test instruments, combining high-frequency dynamic testing and creep/pull-to-failure capabilities in a single test instrument, are available in a variety of configurations. In addition, customers using earlier versions of the ElectroForce 3200 and LM1 TestBench instruments can upgrade to the new range of displacement. 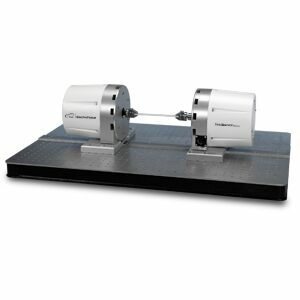 A 5.6Nm rotary brushless motor is an option for the 200N/400N TestBench instruments. It is useful for fine control, low torque applications with or without axial loading. It can be configured for continuous rotation for applications such as screw insertion simulation.